The direct correlation between disease and lysozyme (LYZ) levels in human body fluids makes the sensitive and convenient detection of LYZ the focus of scientific research. Fluorescent molecularly imprinted polymer has emerged as a new alternative for LYZ detection in order to resolve the limitation of immunoassays, which are expensive, unstable, require complex preparation, and are time consuming. In this study, a novel fluorescence molecularly imprinted polymer based on Navicula sp. frustules (FITC-MIP) has been synthesized via post-imprinting treatment for LYZ detection. Navicula sp. 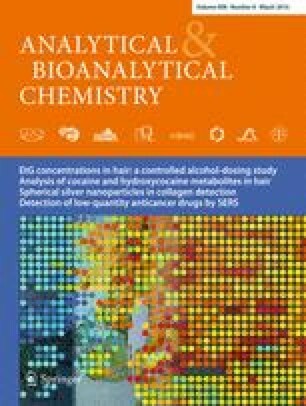 frustules were used as supported material because of their unique properties of moderate surface area, reproducibility, and biocompatibility, to address the drawbacks of nanoparticle core material with low adsorption capacity. The FITC acts as recognition signal and optical readout, whereas MIP provides LYZ selectivity. The synthesized FITC-MIP showed a response time as short as 5 min depending on the concentration of LYZ. It is found that the LYZ template can significantly quench the fluorescence intensity of FITC-MIP linearly within a concentration range of 0 to 0.025 mg mL–1, which is well described by Stern-Volmer equation. The FITC-MIP can selectively and sensitively detect down to 0.0015 mg mL–1 of LYZ concentration. The excellent sensing performance of FITC-MIP suggests that FITC-MIP is a potential biosensor in clinical diagnosis applications. The online version of this article (doi: 10.1007/s00216-015-9298-6) contains supplementary material, which is available to authorized users. This work is supported by Postgraduate Research Grant Scheme (grant no. 8046003), FRGS grant (6071271), and Research University Grant (814209). G.W.L. is financially assisted by MyPhD scholarship from the Ministry of Higher Education of Malaysia. All authors are affiliated with Membrane Science and Technology cluster USM.